Here it is! My band, As the City Rumbles Underneath's new video. This one was done with a lot more planning and we're really happy with the results. We hired an experienced friend, Hunter Luis to direct which took a lot of pressure off us so we could just be "artists". Another friend of mine, Jake Vincent was the videographer and he did a really great job. Roz Gracie edited again and because she had a lot more footage to work with she really outdid herself this time. It's times like this that you can appreciate having such talented friends! Whenever we do a video we get a few visuals in our heads and then we kind of do everything impromptu during shooting. The main visual I had for this song was two separate pieces of poster board with a half a heart so when they're combined you'd have a heart. 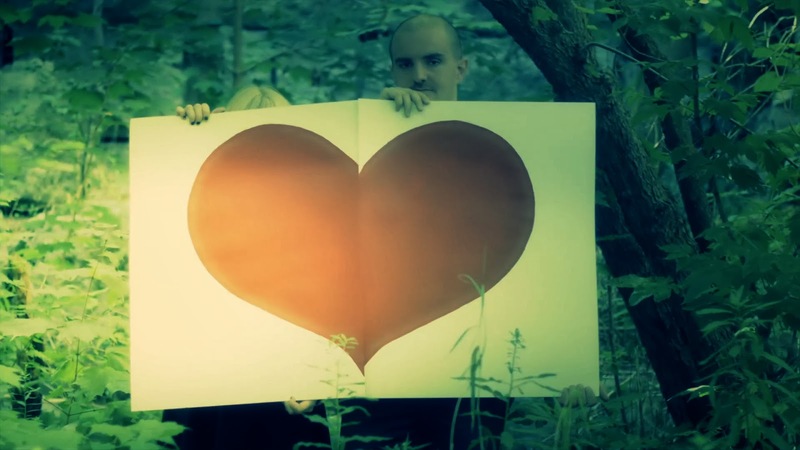 We took a lot of B roll with those hearts and I thought it looked great. Props to Hunter Luis for making such great hearts! Here they are drying the day before shoot day. I'm writing this post to help fellow music producers and engineers who may have the same problems I've had with wrist pain. Keep in mind I'm not a doctor so please contact your own doctor before making any changes to your healthcare. Something that a lot of people aren't aware of is that being a modern music producer/engineer involves a LOT of tedious editing on a computer. One song can easily have hundreds of very small edits to make the performances sound perfect. It's great that we have the technology to do this sort of editing but it does come with a toll to the person whose job it is to do it! There are a lot of music producer/engineers, myself included that have extensive wrist problems as a result of the years of editing on computers. I myself developed problems about 3-4 years into my professional career. It's kind of hard to describe what it feels like other than to say there’s a bit of pain and discomfort while working on a computer or playing some instruments. I remember in 2004 it got so bad that I actually wasn't sure how I was going to be able to keep working. Needless to say that was a pretty scary time. I went to the doctor and after some tests all she could really tell me was that I didn't have tendonitis. She described the problem as a "repetitive strain" injury. After I got the brace, things got a lot better and as time progressed I found I didn't have to wear it as often. My wrists still felt a bit stiff and there was always a bit of discomfort but it was more manageable. One day I was working with a friend of mine and she noticed the brace and mentioned I should try glucosamine which is a supplement made for joints. I picked some up at a local health food store and noticed an improvement with how my wrists felt after about a month. Fast forward another couple of months and a chiropractor friend of mine (Dr. David Koivuranta http://www.dkchiro.com/) mentioned some supplements made by Isotonix. They make a "joint health" supplement with glucosamine and some other goodies that were supposed to be really effective. It was a lot more expensive than normal glucosamine but I figured I'd give it a try. After a month everything was feeling night and day better. I still wear the brace as a preventative measure but it's rare that I feel any discomfort now. The main reason I'm sharing all this with you is that you should be aware of what all those tiny edits are doing to your body and try to prevent the damage from happening. As music industry professionals we work long hours with few days off and eventually all that strain we're putting on our bodies catches up with us. I'll probably always have issues because to a certain extent the damage is done, but if it hasn't gotten that bad for you or you're just starting out, do yourself a favor and buy a wrist brace to prevent any future damage. If you're starting to notice problems I genuinely hope you find this post helpful. As some of you may know I've been working on a project with a good friend of mine Cat Forsley, called "As the City Rumbles Underneath". She approached me about making "shoegazer" music last summer and I got really excited about the prospects of doing something like that. In the 90's while in college I fell in love with bands like My Bloody Valentine, Slowdive and Curve but I've never really had a lot of opportunity to pursue those kinds of sounds in my professional career at the studio. 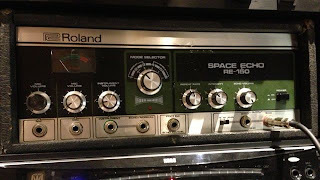 Generally my space echo from the 70's sits idle, my many delays cry for... well you get the idea. If you don't, here's a picture of my space echo which I use quite a bit for the music we make. Anyway, I was really interested in doing something like this and using some of the gear I've accumulated in a new way but I wasn't interested in recreating something that bands from the past had done. Cat and I both felt there was no reason to repeat something that was done in the 90's. The things that always bugged me about a lot of the shoegazer music I used to listen to was how buried the vocals were. In some cases (Slowdive) there were some incredible songs buried in the ambience and in other cases (MBV) there wasn't a lot of vocal melody in what were some pretty spectacular guitar sounds. I'm not saying either approach is right or wrong but I really wanted to bring my pop sensibility both in melody and vocal production to this type of guitar sound. Something else I wanted to do a bit differently was creating a really heavy rhythm section underneath the guitar wash. We've been using really heavy programmed drums along with real drums and I also have a great analog synth to create the bass lines. This I feel gives everything a more modern sound and also appeals to my love of pop music. Along with making some music that I'm really feeling great about we also made our first music video with the help of Sarah Thomson who shot it and my girlfriend Roz Gracie who edited it together. For both of them this was a first and I have to say I'm pretty impressed with the results. I have no idea where this experiment will take me but I'm making some of the best music I've ever made and I'm having a lot of fun. I also think having some experiences as "an artist" will really help me gain some insight about how one can promote oneself in the age of social media. This will in turn help me, help my clients (yes I'm still producing and mixing for other people and have no plans on stopping) to move further with their own careers. Below is our first video for the song entitled "When Stars Collide"